Discover which close grip bench press benefits are most desirable to you. 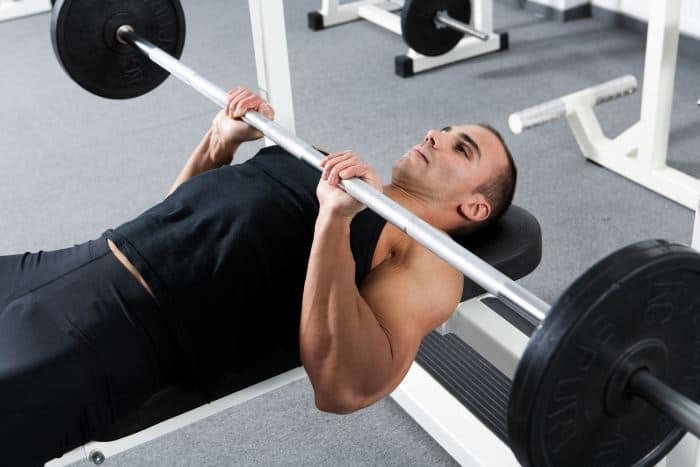 The close grip bench press – also called the triceps bench press – is the best overall triceps exercise there is. At least, that’s my opinion of it. Triceps dips are a close second. In this article, I’ve listed and described all the top advantages of this popular exercise. Probably the best of all the close grip bench press benefits is the ability to use it to build muscle and/or strength. If that doesn’t make sense right away, let me explain. You see, some triceps exercises are more conducive to gaining strength (e.g. rack lockouts). Whereas, others are more conducive to building muscle (e.g. dumbbell triceps extensions). Written directly below is the definition of load intensity, a term that you’ll see mentioned several times in the ensuing bullet points. Load intensity refers to a given trainee’s subjective valuation of the “heaviness” of weight used (i.e. how heavy it feels to the trainee). It is sometimes expressed quantitatively, as a percentage of the trainee’s one repetition max on a given exercise. …It’s a good visual show which characteristics an exercise must possess and how it should be performed, to achieve different goals. As we saw, the close grip bench can be used to achieve for all 3 of the goals discussed. The next of the close grip bench press benefits I’ll mention is the its propensity to boost your bench strength. As discussed earlier, the close grip bench press significantly increases triceps strength. Stronger triceps play the most major role in increasing bench press strength. After all, the triceps play a major role in the traditional bench press exercise. The front deltoids are involved in the close grip bench. And although their involvement is limited, they nonetheless play a minor role in increasing your bench numbers. The chest muscles are only trained peripherally in the close grip bench press. However, they still play a noteworthy role in producing a bigger bench press. The last of the close grip bench press benefits I’ll discuss is the great ease of setting it up. Obviously, this is an immediate benefit. Not a long-term one. But it is a benefit that deserves mention, nonetheless. All other compound triceps exercises – triceps dips, rack lockouts, floor presses, among others – require a more time-consuming set up. For example, with weighted triceps dips, you must attach weight to your body with a dip belt. Adding/removing weight plates onto/off of the belt can be a tedious process. Close grip (hip width) reverse grip bench press (also called close grip Barbarian press) absolutely blows away any other tricep exercise. However you must do it with spotter bars, because there is a tendency for the bar to unexpectedly fly towards your face! Thanks for the great recommendation, Ben.